The Blue Monkey Coconut Collection is the creation of a full beverage line, from pure, fresh coconut water, with and without pulp, to all natural juice and coconut blends. Blue Monkey crystallized, de-hydrated coconut powder was developed for active people on the go who are still able to attain the benefits of coconut water, by simply adding the packet to a bottle of pure glacier water. 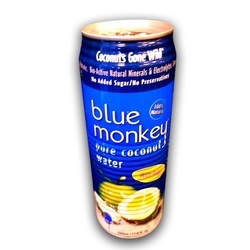 The authentic taste profile is equivalent to the same coconut water found in the traditional Blue Monkey container.